The Norwegian band's raucous, charming debut album deserves a much wider audience outside their home country. So lively are the live performances by Oslo, Norway's Katzenjammer that they're enough to wipe the bored expression off any jaded indie scenester and replace it with a big, stupid grin. Of course, that'll happen when you've got four exceptionally talented female multi-instrumentalists performing an odd, hyperactive hybrid of folk, country, cabaret, and rock loaded with gorgeous four-part harmonies, the quartet maniacally alternating lead vocals and swapping instruments, including accordion and a gigantic contrabass balalaika, in between songs. They can bring a house down with a rousing set, they're able to avoid sounding like a novelty act by offsetting their eclectic nature with a real sense of authenticity in whatever musical style they perform, and their musical chops are undeniable. But the one question that can dog any exceptional live act is, can they translate that contagious energy onto an album? 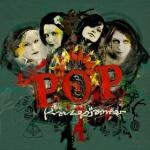 Goodness knows Solveig Heilo, Anne Marit Bergheim, Turid Jorgensen, and Marianne Sveen try their damndest to exude that concert atmosphere on their debut, Le Pop, and indeed, the album succeeds mightily, the band's notorious onstage ebullience palpable throughout the entire record. And considering how the adjective "busy" is a grossly understated description of Katzenjammer's sound (around 30 instruments are listed as appearing on the record), that's no small feat. Le Pop elicits instant comparisons to everything from Gogol Bordello to the Dixie Chicks to Kurt Weill, with even a little Carl Stalling tossed in for good measure, but with producers Mike Hartung and Kåre Chr. Vestrheim at the reins, the performances are controlled just enough to avoid flying off into a wildly erratic, Danny Elfman-style tangent. Most importantly, though, the songs themselves are good enough to not need much in the way of instrumental gimmickry. Of course, it sure doesn't hurt that Katzenjammer has a "fifth member" in the form of the somewhat mysterious songwriter Mats Rybø, who wrote the bulk of the material on Le Pop. Whoever he is, Rybø knows what he's doing, as his nine songs all play to these musicians' strengths and, most importantly, are all instantly memorable. Built around a ludicrous mariachi trumpet fanfare and even more farcical, Python-esque coconut clip-clops, "A Bar in Amsterdam" alternates madly between Balkan folk and Spaghetti Western soundtrack music, but this manic mixture is made palatable by the rich harmony vocals in the chorus. "Virginia Clemm" shamelessly delves into 1930s Weimar cabaret as Heilo sings of Edgar Allen Poe's young wife, the lively "Play My Darling Play" is tinged with Irish folk, while the polka-tinged "To the Sea" is a stirring little shanty bolstered again by those ever-present harmonies. Although all four band members prove to be strong lead singers, it's Sveen who emerges as the best on this record, her three lead performances displaying some rather impressive range. She sounds perfectly at home on the unapologetically twee "Tea with Cinnamon", but then turns right around and is just as convincing on the dark, rampaging "Hey Ho on the Devil's Back". And although it would be easy to dismiss "Ain't No Thing" as a somewhat rote exercise in blues songwriting, the chameleon-like Sveen is absolutely convincing in her delivery, howling as if she'd been born and bred on the Mississippi Delta, and not somewhere near the Arctic Circle. Gregarious, vivacious, and with just a little punk rock attitude, the likeable Norwegian label Propeller Records is on to something awfully promising in Katzenjammer, and considering the broad appeal of the music on Le Pop, it's something that begs for wider distribution. For now, though, it'll have to remain one of 2008's finest hidden gems, and those of us on the other side of the Atlantic will be crossing our fingers that these four charming ladies will eventually bring that vaunted live show our way.